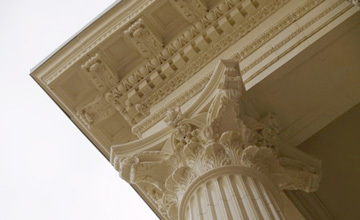 Architectural Terra Cotta Columns: repair, replacement and restoration. Architectural Terra Cotta was used to produce columns for several historically significant structures in the USA. The style of terra cotta columns varied from the classical orders of Doric, Tuscan, Ionic, and Corinthian to columns in the styles of Art Nuevo, Egyptian Revival and Art Deco. Stromberg has been involved in the restoration and replacement of terra cotta columns on several of these architectural masterpieces. Following is a brief description of the columns, the process and the results. If you need further assistance, please give us a call. 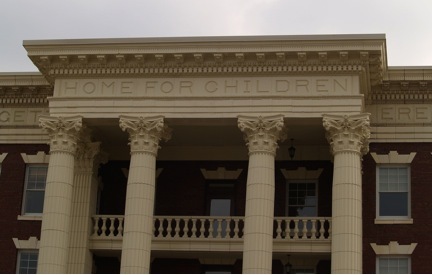 Restored terra cotta columns and cornice work by Stromberg TerraGlas. Blodgett Building, Grand Rapids, Michigan. Another view of the Blodgett buildings terra cotta columns, balustrade, entablature and cornice. The entire front entrance facade was missing. Replacements pieces were made from both molds taken of existing pieces and new re-sculpted pieces, such as the Corinthian columns, entablature, cornice and balustrade shown here. 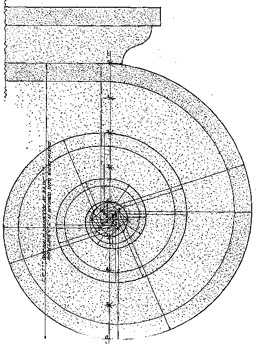 Method of determining the entasis or taper of a terra cotta column shaft. Since the entasis starts out gradual and tapers more and more as it goes up, the layout can be difficult. 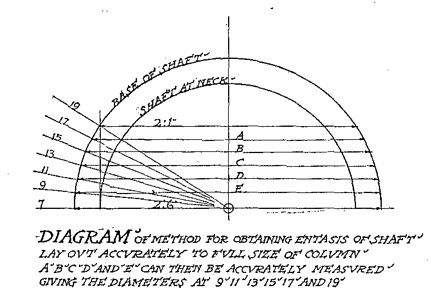 The traditional method of determining the entasis was to first determine the top and bottom diameters for the column type you had. Then the bottom 1/3 of the column shaft would remain straight. In the example shown here, this is an Ionic column, 2' 6" diameter and 9 diameters or 22' 6" tall . The bottom 1/3 is 2' 6" diameter. The next two thirds are divided per the layout above. 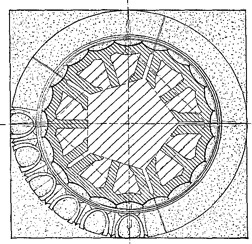 Architectural terra cotta Ionic capital showing a section through the capital and a side elevation and showing the sectioning method used in most historical terra cotta installations. During terra cotta restoration or replacement, the new restoration pieces and materials must blend with the old terra cotta and be able to work with the existing terracotta anchorage methods. Plan section at the neck of the Ionic capital looking up. Note the steel column used in the center of the terra cotta column. The individual terra cotta elements are pinned together and tied back to the steel column. 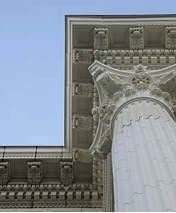 Historically, columns under 16" diameter could be produced as complete round drums in traditional architectural terra cotta in segments up to 20" tall. 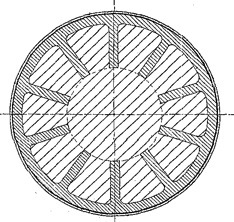 Columns over 16" diameter were segmented as shown in this illustration. With TerraGlas, the component sizes can be much larger, but the sizes may be kept smaller to match the historical terra cotta jointing pattern. 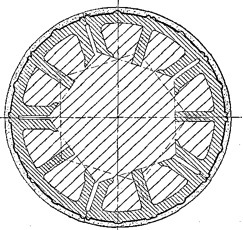 Plan section of a column base looking down and showing the pinning of the column segments used with traditional terra cotta columns. In TerraGlas, because of its higher strength, the option of larger pieces is available. Plan through section "A" of the terra cotta column above. Plan through section B of the terra cotta column shown above. 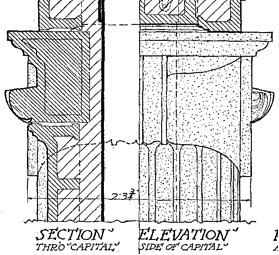 Elevation of the capital of the ornate Doric terra cotta column shown above. 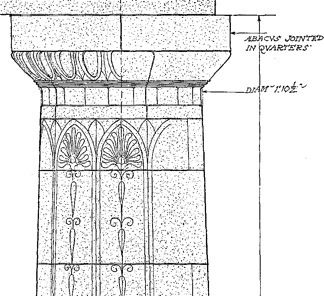 Section through the terra cotta column, entablature and cornice showing the traditional attachment method for historic terra cotta. During terra cotta restoration or replacement, the terra cotta is typically removed, new steel attachments are added and any broken or damaged pieces are replaced. Sometimes the entire terra cotta assembly must be replaced. The most common problem with architectural terra cotta is the swelling of the steel caused by rusting. The rusting steel leaves the terra cotta unsupported and at the same time the swelling of the rust pushes the terra cotta out of position. When most terra cotta buildings were built, the concept was that the terra cotta was impervious to water and rusting was not a major concern. In actual practice, the architectural terra cotta is, for the most part, impervious to water, but the water finds it way in through mortar joints and cracks. Once moisture is inside the terra cotta assembly, the rusting of the support steel begins. If you have a restoration or renovation project involving terra cotta, cast stone, or limestone, please give us a call. We can assist you with color matching, technical guides and assistance with molds and models. Copyright © 2008 TerraGlas and The Stromberg Group. All Rights Reserved.